Discount store in New York. 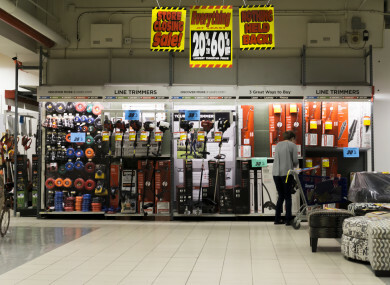 DISCOUNT AND HARDWARE stores are to be targeted by health and safety inspectors to ensure that none of their products contain banned chemicals. The chemicals cadmium, nickel and lead are banned in jewellery. Benzene, chloroform and toluene are banned in glues and adhesives. The Health and Safety Authority (HSA) has today launched a nationwide inspection campaign to ensure that hazardous chemical products for sale in stores comply with the relevant EU chemical legislation, which is designed to improve chemical safety. Inspections will focus on cleaning and laundry products, air fresheners and reed diffusers, paint products, jewellery and glues. Cadmium is a highly toxic metal. Lead is a poisonous metal which, if ingested, can result in damage to all organ systems in the body. Benzene has been classified as “carcinogenic to humans” by the International Agency for Research on Cancer, based on evidence that it causes acute myeloid leukaemia. “This year we will focus our inspections on discount stores and hardware stores. Specifically, we will be checking the labelling information and also packaging to ensure that products which are required to have child resistant fastenings are compliant,” Kevin Buckley, senior inspector with the HSA said. This campaign is primarily aimed at retailers and consumers. However, it is important that importers, manufacturers and distributors are aware of the legal requirements governing the safety of chemical products. “Retailers selling such products should check with their suppliers to ensure that their existing stock is compliant, and all non-compliant stock should be removed from the shelves,” Buckley said. Any substance that poses an “unacceptable risk” to human health or the environment that is deemed to require EU-action can be restricted under REACH. REACH is a European Regulation which aims to “provide a high level of protection of human health and the environment from the use of chemicals”. Restrictions can be placed on the manufacturing, placing on the market and use of certain dangerous substances and mixtures. Restrictions can take different forms from a total ban to severe limitations placed on their sale, such as not being allowed to be supplied to the general public. Email “Watchdog to target discount and hardware stores for banned hazardous chemicals ”. Feedback on “Watchdog to target discount and hardware stores for banned hazardous chemicals ”.